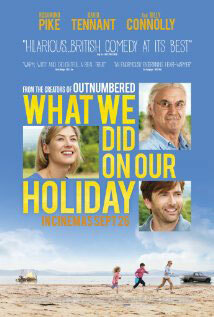 SOME of Britain’s best-known actors and performers are on screen in this summer holiday family romp. Doug (David Tennant) and Abi (Rosamund Pike) are a couple teetering on the edge of separation, but they’re prepared to put their bickering on hold so that all of them – especially their three children – can have a memorable holiday. So they set off for Scotland, to Doug’s family home in the Highlands to be precise. The central premise of the holiday excursion is to celebrate the 75th birthday of Doug’s father Gordy (Billy Connolly). The fact that Gordy is suffering from a terminal cancer and additionally that their imminent divorce is looming are two matters Abi and Doug try desperately to conceal from their brood. Even though the parents don’t want to spoil Granddad’s big day with talk of divorce, these are truths impossible to hide for very long. The oldest child Lottie keeps a notebook or diary in which she records everything around her. Prime among these musings are the subterfuges expected of her and her younger siblings by Abi and Doug. Throw into the mix Doug’s straitlaced brother Gavin (Ben Miller) and his neurotic wife Margaret (Amelia Bullmore) and the number of odd adults the children must tiptoe around is increased by two. The fact that Abi and Doug bicker most of the time, and not always out of earshot of their brood, adds to the angst of their three children. These children (Emilia Jones, Bobby Smalldridge and Harriet Turnbull) are really the stars of this family comedy. They’re the responsible ones and, dare we say it, the people who act like real adults. One of the movie’s best scenes is shot on a remote beach where Gordy and the three children engage in some very frank discussions. Of course in real life Connolly has had his prostate removed following a cancer diagnosis and is suffering from Parkinson’s disease. There’s real poignancy here in an older man reconciling himself to death. And Rosamund Pike, fresh from her Oscar-nominated role in Gone Girl, has the chance to throw off her chameleon persona and appeal in a less demanding piece of cinema. This entry was posted in Movies and tagged Billy Connolly, David Tennant, Death In Paradise, Rosamund Pike, What We Did On Our Holiday. Bookmark the permalink.